Why should I choose Simon Says Brownies®? Our quality speaks for itself— try them once and you will agree they are simply the best. Simon Says Brownies® are made fresh to order to YOUR specifications, which makes them special. You'll never want out–of–the–box brownies again. What ingredients does Simon Says Brownies® use? Wheat, eggs and dairy are all part of the recipe. Some of our products do contain nuts, therefore we cannot guarantee other products will be 100% nut free. Simon Says Brownies® is considerate of allergy concerns and labels the product accordingly. Does Simon Says Brownies® deliver? Yes, there is a limited delivery area and a $5 minimum delivery fee. Pricing is calculated by distance. Please inquire for details. Does Simon Says Brownies® ship out of state? Yes, email for details and pricing. Does Simon Says Brownies® make gluten-free products? 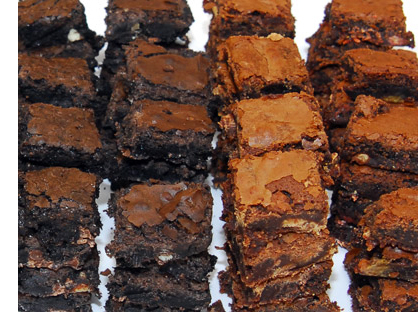 Does Simon Says Brownies® offer catering? Yes, trays can be made for any occasion. Please inquire. What types of packaging does Simon Says Brownies® offer? Various sized trays and gift bags. Packaging can be customized for special events. Can I design my own brownies? Yes, you can choose milk or dark chocolate or both, and add in the mix-ins of your choice. That is what makes Simon Says Brownies® so much fun! We use all of YOUR favorite mix-ins. Do you decorate brownies for birthdays and other occasions? No, that is not offered at this time. However, packaging can be tailored to your needs. How should I save, serve and store Simon Says Brownies®? Simon Says Brownies® are made fresh to order without preservatives. Brownies are best kept frozen prior to serving. They may also be refrigerated. They never last long enough to go bad! Orders need to be placed 5-7 days in advance. I have a question that has not been answered, what should I do? Click on the contact button below to submit your question. Simon Says Brownies® prides itself on excellent customer service and will respond as soon as possible with your answer.